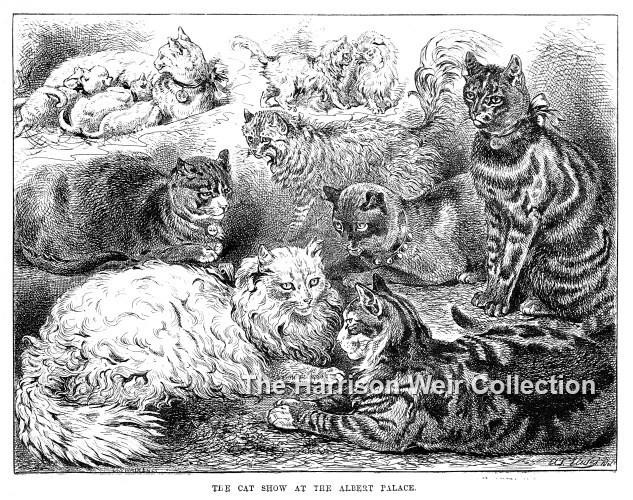 CAT SHOW Print, is taken from "The Illustrated Sporting & Dramatic News" dated October 3rd, 1885. It features some of the Prize-winning Cats, exhibited at the Albert Palace Show. The drawing is by Albert Elwes.Of particular note is the White Persian cat, the Siamese cat, and in the top left corner, a mother cat nursing kittens. It was not at all unusual to see a mother cat nursing kittens at these very earliest shows, and in fact on one occasion a cat was caged nursing a litter of squirrels!